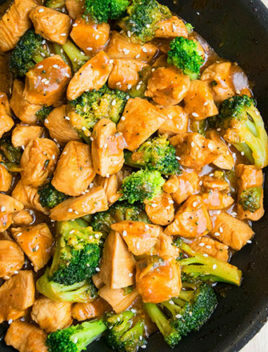 Quick and easy chicken and broccoli recipe, inspired by Chinese flavors and made with simple ingredients on stovetop. It’s a simple weeknight meal and requires just one pot and 30 minutes. This chicken and broccoli has been on my meal plan rotation for at least a year now. My family LOVES it, especially my kiddo. 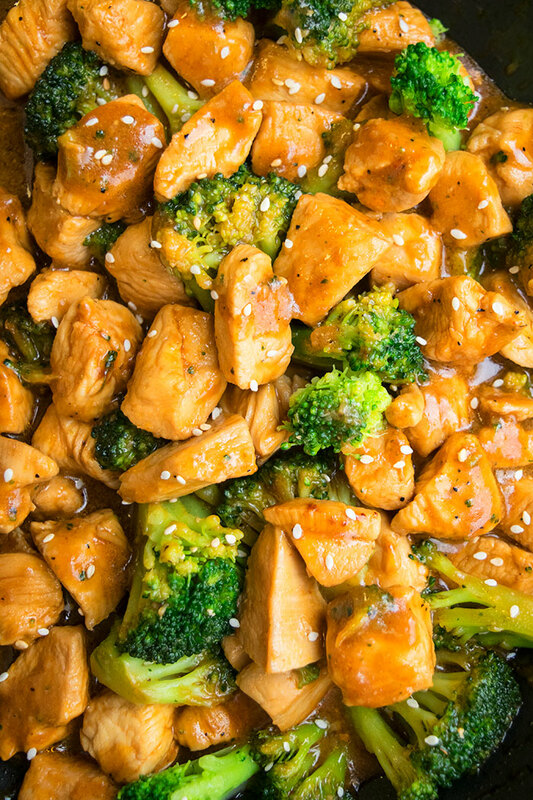 This easy chicken and broccoli stir fry recipe beats takeout! Plus, it’s cheaper than takeout too and that’s always a good thing. Use a NON-STICK pan to prevent any sticking and burning. DON’T omit sesame oil because it adds a lot of flavor and fragrance to the overall recipe. Use LOW SODIUM broth and soy sauce to prevent the meal from becoming too salty. Instead of chicken broth, you can use vegetable broth or water. Brown sugar can be replaced with honey but it really alters the overall flavor and I don’t recommend it. Fresh or frozen broccoli can be used but frozen is so much faster and easier. If you are using fresh broccoli, you have to blanch it first. If sauce becomes too THICK, add a little water to thin it out. If sauce is too THIN, cook for longer without lid until liquid is reduced to your desired consistency. Make chicken and broccoli pasta by adding 2 cups of cooked pasta in the pan at the end and mixing everything together. Make crockpot chicken and broccoli/ slow cooker chicken and broccoli by dumping all the ingredients in a slow cooker and cooking on low for 3 hours. 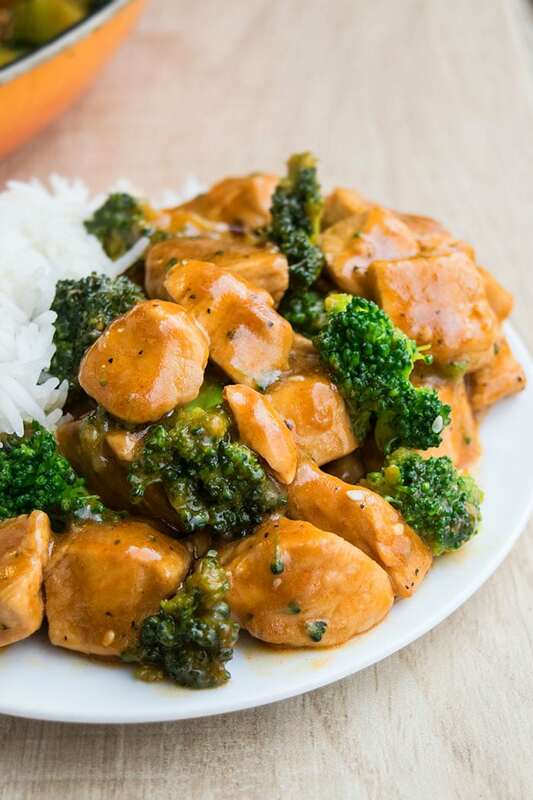 How to make chicken and broccoli? Heat oil and stir fry chicken until golden brown. Add soy sauce, vinegar, broth, salt, pepper, brown sugar, ginger, garlic, cornstarch and mix everything well. Cook without lid until liquid is reduced and sauce is to your desired thickness. Enjoy! Is Chinese chicken and broccoli good for you? This recipe is fairly healthy because there are no preservatives, food colorings and artificial sweeteners. It’s made with simple, fresh ingredients. What is Chinese brown sauce made of? 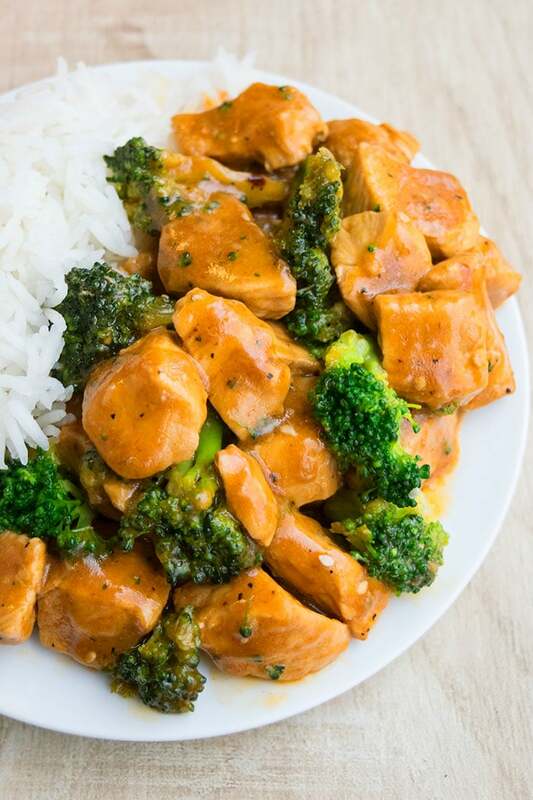 Quick and easy chicken and broccoli recipe, inspired by Chinese flavors and made with simple ingredients on stovetop. It's a simple weeknight meal and requires just one pot and 30 minutes. Pour sesame oil and olive in a non-stick pan and heat it over medium heat. Add chicken and cook until golden brown. Add ginger, garlic, salt, pepper, red chili flakes (optional), soy sauce, vinegar, brown sugar, cornstarch and mix everything together. Tip: Mix broth and cornstarch together in a cup and add that mixture into the pan to prevent any "cornstarch lumps" from forming. Add broccoli and mix again and let everything cook for a few more minutes until the sauce thickens and liquid is reduced to your desired consistency. Garnish with sesame seeds, if you like. Enjoy! If you are using fresh broccoli, there is an additional step: Bring a pot of water to a boil and blanch the broccoli for 5 minutes. Then transfer the broccoli to an ice bath to to stop it from continuing to cook. Such a great way to enjoy broccoli! Definitely must try this! Looks delicious! A perfect weeknight meal! One pot meals are such a life saver on busy nights! Great meal and less clean up! I love the flavors in this dish! This is right up my alley! One pot dinner for the win! Totally don’t have to order take-out now!